How do you know if renting a shed is a good option for you? If you can identify with one or more of these statements, you would definitely benefit from having a rental shed. There are many reasons why renting a shed might be the right choice for you. For instance, if you need more space for your business—more room for inventory, temporary office space, or utility storage— you can pick one that suits your needs and have it delivered to your location. Maybe you want a convenient backyard shed at the home you’re renting. If so, renting a storage shed is a great way to stay in budget and protect your possessions while keeping your property looking nice. You don't have this level of flexibility or practicality with a storage unit. While there are many benefits to renting a shed, here are our top four. When things like lawnmowers, ATV, grills, and bikes are left outside and exposed to the elements, you run the risk of them being damaged, broken, or rusted through—all of which means their lifespan will be dramatically shortened, and you’ll likely need to pay for a replacement sooner than later. No good, right? It may be financially better to find a way to properly store these items than to replace them. Also, in many cases, renting a storage unit and forking out the money to cover the cost of your time and fuel running to and from the unit adds up quickly. Every run you make to your storage unit ups the total price your paying for storage. With a shed rental, you pay a set monthly fee, but your items are properly stored, so you don't’ have to replace them prematurely, and you don’t have to burn fuel or time accessing your stored items—you just need to step into your backyard. Working with your means is ideal. Financially, no one should break the bank in order to have a way to safekeep personal belongings. So, before pulling out the credit card or signing the financing agreement, consider the price and benefits of protecting your things while staying in budget. Having a high-quality storage building in your backyard does not mean you have to finance, drain your saving account, or pull resources from another budget line item. 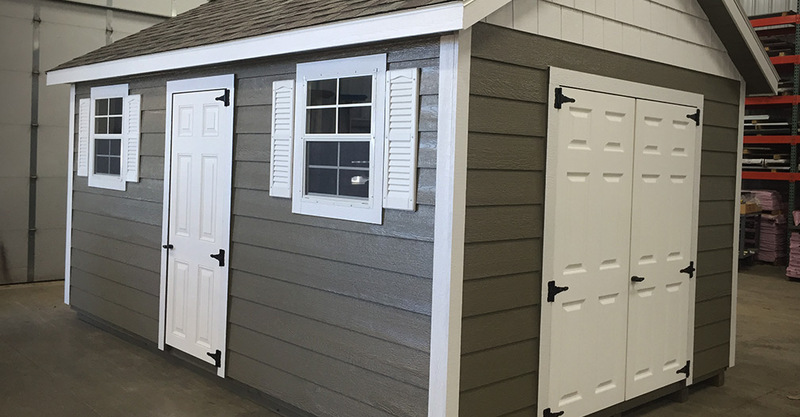 You can get a premium storage shed through a trusted shed rental program. It’s true that you can stay in budget and take care of your items. It can be a waste of time and money driving to and from an off-site storage unit. Plus, when you want something that’s in storage or if you have something that needs to go into storage, having to go somewhere else is not convenient. Imagine storing seasonal decor items where they can be easily accessed and put away. Don’t load up the car and drive to a unit. Pack up your stuff and walk it to your backyard shed. Stop wasting precious time, access stored items easy, put things away quickly with a rented backyard shed. If you only need a short-term storage solution, be it one year or five, renting a shed is a great option. Shed haulers can drop off the rental shed when you need it and pick it up when the need is no longer there. Maybe you’re renting a home or a building for business and a secure but a temporary storage solution is needed. A rental provides all you need, and because it’s premium, it’s built well and looks attractive. Ready to rent a High Quality Backyard Shed? Here’s how. You can get a durable, high-quality storage shed in your very own backyard or delivered to your business with our affordable Shed Rental Program. Having a shed in close proximity means you won't waste fuel driving back and forth from an overpriced rental unit. And choosing a shed and having it delivered to you is easy. That’s why it’s our mission to provide products that are built well, worth every dollar, and help solve your storage dilemma. We care about helping you organize your life, assisting you as you look for the best storage solution for your needs, and making the purchasing process as easy as possible. That’s why we manufacture quality outdoor storage structures in an environment of care and respect, for the safekeeping of people’s possessions and to help organize their lives. That’s our mission and we live by it. Learn more about renting a Dakota Storage Buildings' shed. This may be exactly the storage solution you’ve been searching for. Storage Unit Rental, DIY Shed Kit, Or Pre-Built Shed—Which Is Best For You? Should I Buy A New Shed Or A Used Shed? It’s our mission at Dakota Storage Buildings to make affordable, high-quality buildings that meet storage needs and exceed expectations.